Man Booted Off Flight After Confronting Texas Governor On Marriage Stance - Joe.My.God. As he was waiting with family and staff to board a flight back to Austin on Tuesday night after two days promoting Texas in New York City, Gov. 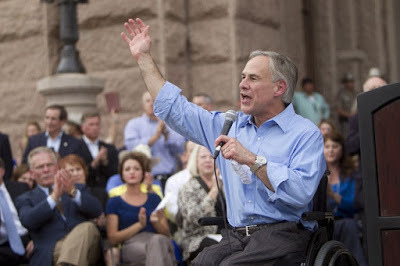 Greg Abbott was approached by another passenger who shook his hand and then loudly and profanely expressed his unhappiness with the governor’s opposition to gay marriage. “I hope you … go to hell because of your stance on gay marriage,” the man told the governor, using an epithet for emphasis, according to Abbott communications director Matt Hirsch, who was with the governor. The man, identified only as a 32-year-old male by Port Authority police, was asked to step back by Texas state troopers traveling with the governor. The passenger was not arrested. Abbott later expressed his gratitude to airport officials.